Recreating leftovers from yesterday’s feast into new meals can make them more appealing and prevent the glutinous food waste associated with large feasts. In our family, we use leftover mashed potatoes to make potato pancakes. This recipe is simple and delicious. To make potato pancakes from leftover mashed potatoes, simply form them into a small patty, about three inches in diameter. Add a vegetable to the mix, such as corn, peas, grated carrot, or cooked kale, to boost the veggie power of the potato pancakes. Then fry the patties in oil, being careful not to flip them too often, or they will fall apart. Serve with apple sauce, and you have a great, kid-friendly meal.We don’t eat a lot of fried food, as it is obviously not good for your health. This is probably why I feel the need to pack extra veggies in the potato pancakes and serve them with apple sauce. …not only is edible food discarded that could feed people who need it, but the rate of loss, even partially corrected, could save US consumers and manufacturers tens of billions of dollars each year. Jones says these losses also can be framed in terms of environmental degradation and national security. When we want to reduce, reuse, recycle, eliminating our food waste is definitely part of the equation. This is especially challenging for my family, since we live two hours from the grocery store. We have to stock up when we go to town, but learning to stock up on food products without excess is a challenge. I also feel guilty at how much food is wasted in our garden and orchard. 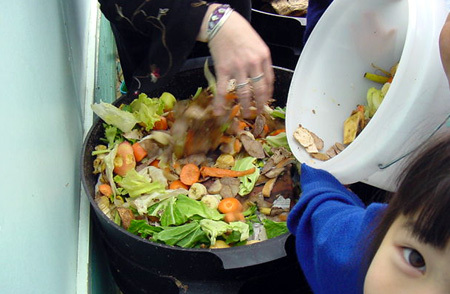 Cutting food waste would also go a long way toward reducing serious environmental problems. Jones estimates that reducing food waste by half could reduce adverse environmental impacts by 25 per cent through reduced landfill use, soil depletion and applications of fertilisers, pesticides and herbicides. Eat those leftovers and take another small step towards reducing your family’s impact on the environment! Happy Buy Nothing Day! Image courtesy of Pigeon Mountain School. What’s even better is the old scottish recipe ‘potato scones’. Take mashed potatoes, add enough flour to make soft dough, roll out in thin rounds (we quarter the rounds) and cook both sides, in a dry frying pan, till brown spots appear. Do not use oil, this ruins them. They are great eaten plain with a bit of butter or jam or P.B., but are even more amazing when cooked whole and wrapped around a plethora of different fillings, like a roti shell or a wrap. I’ve had them wrapped around stew, curry, leftover veggies, anything that goes well with potato! And they freeze well too. My kid loves them so much I’m required to make extra mashed potatoes when I make them. Left over mashed potatos mixed with egg and fine bread crumbs, black pepper & garlic salt & haft a cube of crushed chicken broth cube. The mixture should be thick and easy to form a firm patty. Make small patties and fry in hot oil. Turning one time so that the patties don’t break apart. Served with egg and corn beef hash. You can substitute the hash for bacon or ham slice. A brown gravy is a nice touch to pore over the fried potato pancake. Left over mashed potatoes mixed with egg and fine bread crumbs, black pepper & garlic salt & haft a cube of crushed chicken broth cube. The mixture should be thick and easy to form a firm patty. Make small patties and fry in hot oil. Turning once so that the patties don’t break apart. Served with egg and corn beef hash. You can substitute the hash for bacon or ham slice. Brown gravy is a nice touch to pore over the fried potato pancake.